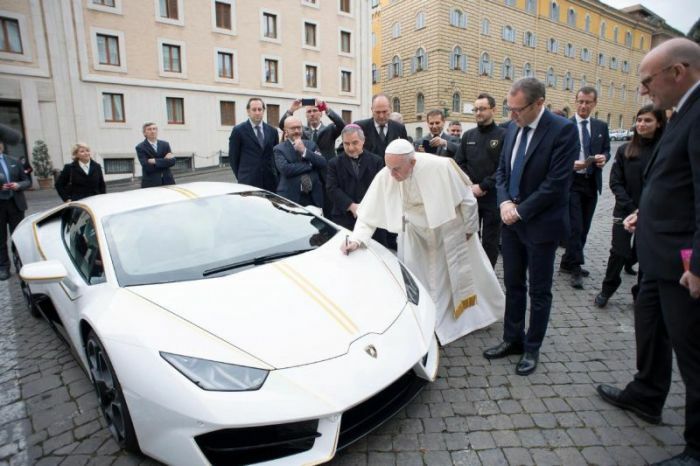 Pope Francis leads a simple life in the Vatican, so when luxury sports car maker Lamborghini presented him with a special edition Huracan as a gift, he did what is expected of the head of the Catholic Church - he donated it to charity. The officials of Lamborghini gave the white car with yellow gold detailing to Pope Francis on Wednesday, according to Fox News. It was brought in front of the Vatican hotel where he lives, and the pope immediately blessed the vehicle. The car is going to be auctioned off at Sotheby's, and the proceeds will go to the three favorite charities of Pope Francis. One of his selected charities will help rebuild Christian communities in Iraq that were destroyed by the Islamic State. The rebuilding efforts will be focused on Nineveh Plains, which is located north-east of Mosul. The Vatican said in a statement that the financial aid will help displaced Christians "to finally return to their roots and recover their dignity." The second charity helps migrant women who are trafficked and forced into prostitution, while the third one provides medical aid in Africa. The Huracan was first introduced in 2014, and the price of the car starts at 183,000 euros or $217,000. Since the one given to Pope Francis was specially built and designed for him, people expect that the car would fetch more at the auction. Pope Francis does not need the fancy vehicle because he is quite content with the blue Ford Focus that drives him around inside the Vatican walls, according to TIME. During his international visits, the pope often opts for modest Fiats or KIAs instead of bullet-proof SUVs. Before he entered the Catholic Church, Pope Francis used to go around his native Buenos Aires without a car and only used public transportation.